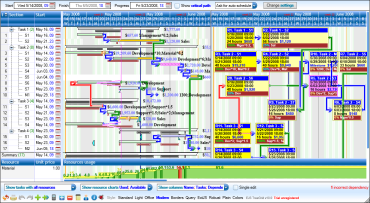 TreeGrid Gantt chart is an application core for building online (web based) project management software like MS Project or Oracle Primavera. 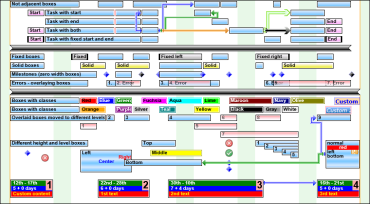 It is the most complex web Gantt chart and universal bar chart on the Internet. advanced formatting values for displaying and editing, according to the type and format string. Holidays exclusion (working time calendar) - any defined dates, date ranges or repeated dates. Possible adding, modifying and deleting calendars. The holidays are excluded from Gantt calculations and can also be hidden from the chart. Every task can have different calendar. Custom CSS styles, every cell can display completely different bars (shapes and colors). Various types of bars with different features, like normal, empty, not movable, not resizable, start/end, etc. Individual box identification, manipulation of particular boxes or box groups by API events and methods.